Yeah, I have a lot of chalk in the Frozen Four, but I think the top seeds other than Yale are very strong. Really, I think ANYONE can come out of that East bracket (yes, I’m a Yale hater…so be it). I do think the semifinal between North Dakota and BC will be the real national championship game. Merrimack and Miami is probably a tossup, so I went with the Redhawks who have a lot of experience in the tournament in recent years. Still, I’ll be rooting for the Warriors in addition to feel good stories like Union, making their NCAA debut, and Western Michigan who are making their first appearance in the tournament since 1996. Thanks to the overwhelming responses I got from yesterday’s post. My intention certainly wasn’t to solicit positive feedback, though I really appreciate everyone who provided some. I really just wanted to state my case that I don’t think I “fear the truth” when it comes to UMass hockey, as well inform readers that Chip Ainsworth is a media member that talks tough about Toot Cahoon and John McCutcheon from a very safe distance equal to the length of the eastern seaboard. Jon Quick’s goaltending skills have reached Jedi level. Scott Coen featured Paul Dainton on his broadcast last night. In one of the stranger transactions you’ll see Michigan State has filled their coaching vacancy with the commissioner of the conference they just announced they were leaving. UMass fans knew going into the season that this would be a rebuilding year. With 14 of 30 players on the roster being freshmen or redshirt freshmen I don’t know how anyone could’ve thought of this year as anything else. That’s not to say you can’t have certain expectations however. The only difference is success is not necessarily measured in wins and losses. There were a few major accomplishments I hoped to see this year when I first wrote my preview in the fall. That the freshmen would show tangible progress by the time February and March came around and would begin to lead the team as needed. I hoped the team would pull off a big upset somewhere along the way. And I wanted the team to secure a spot in the Hockey East playoffs. Against those expectations I believe the freshmen did show significant improvement as the season went along and at times they carried the load for the team. Unfortunately the team never got that big upset I hoped for. They came close; playing Minnesota tough in the second game, tying BU at Agganis, and leading UNH with only seconds left in November. But that signature win for the season escaped them. They did however play well enough to make the Hockey East playoffs, despite nearly all the pundits saying it wouldn’t happen. And once in the playoffs they performed admirably against a team that could very well go on to win the national championship. UMass had the kind of schedule you probably wouldn’t want to throw at such an inexperienced team. Opening with two at Mariucci, a midseason trip to Wisconsin, having 9 of your last 10 games come against teams in the top 15 in the country are significant challenges for any team. But from the start the team didn’t seem like they were going to let the schedule bother them as they battled Minnesota to a couple close losses, despite losing goaltender Paul Dainton early in the second game and thrusting freshman Jeff Teglia between the pipes. Teglia would play two more games after that, tying and narrowly losing to Boston University, giving high hopes UMass’ future in net. From there things went a little sour however. UMass would drop a game to and tie Providence followed by probably the low point of the season, a 5-2 loss to Army in which the Minutemen were never even in the game. The team would regroup the next weekend, nearly coming away with a win against UNH when Mike Pereira put them ahead with under a minute left only to see the Wildcats even up the score seconds later. That close game was enough to give the team a little of momentum going into Turkey Tuesday and they picked up three wins in three games against Vermont, Quinnipiac, and Lowell. Maine put their win streak to an end however with a dominating 4-1 in Orono to close out the fall semester. The second part of the season got started out in Wisconsin where they played tough against the Badgers at times but in the end were beaten pretty decidedly. Paul Dainton getting ridiculously tossed from the second game meant Jeff Teglia played the majority of minutes against the Badgers. At times he looked great, at times not so much. But if anything the games showed him and goaltending coach Mike Buckley what types of things he’ll have to do going into next season. January was seen as a month of opportunity as all but one of the games were against teams either below UMass in the standings or just above them. They ended up having mixed results. They were unable to solve the tough defense of Northeastern going 0-2-1 against the Huskies during the month. But UMass split a key weekend series at Vermont and completed the season sweep of hapless Lowell River Hawks to put them in 7th place heading into a very tough February and March. And tough it was. UMass would not see another win following their 6-0 blowout of UVM on January 22nd and finished the season on a 0-11-3 streak. Pessimistic fans could see that as yet another late season swoon that we’ve grown way too accustomed too. But I think that’s unfair to the players to think that way and doesn’t relfect how those games actually played out. The team looked very different down the stretch following an 11-2 embarrassment at the hands of Merrimack that rivalled even Mallen-era losses. But from that point on UMass was in each and every game they played, from rematches with the Warriors to going up against #2 BC in the playoffs. Of their last 10 games 9 were either ties or one goal losses (adjusting for empty net goals). The team showed just how far they’ve come this season when they battled on Saturday and had the BC Eagles sweating a bit before the defending national champs finally prevailed to end the Minutemen’s season. The one goal losses is really the biggest number that sticks out for UMass this season. All in all 24 of the team’s 35 games were ties, one goal losses (two in overtime), or a two goal losses that featured an empty net goal. Add that to the six wins and that means that UMass was legitimately in 30 of the 35 games it played this year. That’s not too shabby and something to build off next year. If UMass can convert half of those ties or near losses into a point or two, it’s a much different season. While UMass did see a material drop in offensive production this season compared to last, 2.92 to 2.51, so did the league as a whole. The result was that UMass finished in 7th in scoring among Hockey East teams both years. A good portion of that drop in scoring can be traced to the futility of the power play which went from 20.1% last year, good for 4th in the league, to a mere 14.1%, or 7th. That was further complicated by the fact that the team just flat out could not generate shots on net when they needed. UMass had 10 games with 25 total shots or less and 6 games with total shots of 20 or less. With only two regular defensemen coming back from last year defense was going to be a big concern for the team, even with a three year starter returning in net. The defensive scoring did get a little worse from the year before, 3.49 (9th) from 3.25 (8th). However if you take out that horrendous Merrimack game where obviously the team had some kind of breakdown the number is 3.26 or pretty much in line with last year. I think this is one of the better achievements of this year’s team considering UMass had to replace Justin Braun, easily one of the best defensemen ever in the history of the program and Brett Watson, one of the top defensive forwards in the league. Most nights UMass had four freshmen on defense and yet, with a lot of help from Paul Dainton, were able to do a relatively good job of keeping other teams off the board. UMass also saw slight improvement on the penalty kill from last year when they had the worst PK in the league. Rocco Carzo – Save for one game very late in the season Carzo never looked remotely like the player he was his freshman year when he scored 6 goals. Whether he just clicked with guys like Casey Wellman and James Marcou or something else, UMass will need him to move beyond his sophomore slump next year. He has the skills, given two invites by two different NHL teams to prospect camps, he just has to rediscover them. Marc Concannon – Concannon provided some good grit to the team and played tough along the boards. He had a very specific role on this team and did it well every night. Kevin Czepiel – “Holyoke” continued to improve his game as a playmaker and key faceoff taker. I like the versatility he shows to be able to play on lines with both skill type players as well as third line grinders. Peter DeAngelo – DeAngelo played in about half the games for the Minutemen and at times showed a good ability to move the puck. He’ll need to become more confident and play bigger than his 5’7″ frame if he wants to increase his role next year. Eric Filiou – I thought Filiou moved the puck well and gave good effort in the games he played. For a guy who once scored 29 goals in a BCHL season, I’d love to see him try to take a few more looks at the net. Branden Gracel – Gracel’s playmaking skills were a factor for the Minutemen from day one. It’s obvious he’s a big part of the team’s future. He showed good ability in the faceoff circle. Like Filiou, Gracel put up some big goal numbers in juniors so I hope he can work on that part of his game. Quite frankly, UMass really missed him in that last game against BC. Steven Guzzo – Guzzo blew out his knee practicing the day before UMass’ season opener and just started skating in the last few weeks. He’ll basically start next season as freshman, but one who already knows the schemes and his teammates. He could potentially take over the role played by Concannon or maybe even some more. Danny Hobbs – Earlier in the week I gave my Player of the Year award to Paul Dainton, but if I gave a Most Improved award it would go to Hobbs. He registered 11 points total in his first two years, but put up 28 points this year alone to lead the team. He has a great combination of skill and size and seemed particularly effective camping in front of the net. I cannot say enough about Hobbs’ performance this year. Other than UMass will need more of that next year. Brian Keane – It seemed like Keane finally found his role this year as one of the team’s key defensive forwards. More importantly he seemed like he was comfortable with that role. His effort along the boards and in the grinder capacity was essential to UMass doing as well as they did defensively. Pat Kiley – Kiley played in 7 games and brought a good effort to all of those. I think he’ll really have to step up his game to see time regularly next year. Chase Langeraap – Langeraap certainly ended his UMass career with a bang. I’ll admit that after he didn’t even register a goal in his junior year I expected him to be a regular healthy scratch for this season. And he was at times to begin the season. But from New Year’s on he was easily one of the best players on the team. His 9 goals were more than he had in his entire UMass career before this year and no one played harder in the last couple weeks of the season than him. Mike Lecomte – When Lecomte came back to the team after winter break it appeared that he may be the spark they needed to do some damage down the stretch. Unfortunately after scoring 2 goals in 6 games back he had to be shut down again with problems in his hips. When healthy, Lecomte was an impact player for the Minutemen the past two years. Unfortunately it just never worked out for him. Eddie Olczyk – Surprisingly Olczyk played in less games this year than his freshman year. I don’t think it’s a reflection on his actual play but his style, which is almost exclusively a defensive forward. And a good one at that. With guys like Concannon and Keane graduating I’d be surprised if he didn’t play every game next season. It would be good to see him improve his offensive play however as there were times when he could’ve change the momentum of the game but was unable to get the goal UMass needed. Mike Pereira – Well as I posted already, I think he was worthy of rookie of the year in Hockey East. Pereira played a huge role in the offense and tied Hobbs for the team lead in goals. He had a few stretches during the season where his goalscoring dried up a bit. I think with a year under his belt he’ll be able to figure out a way to avoid such slumps next year. He’s obviously a key part of UMass’ future. Troy Power – It still tough to tell what role Power will play for UMass in the future. He played smart in the 18 games he played in, but it’s a bit of a disappointment that he wasn’t able to find the net at all after putting up 28 goals in the USHL. A year under his belt and maybe mixed with different guys on his line and we could see a dramatically better Troy Power next year. Shawn Saunders – Saunders has played hard in every game he’s played at UMass. And that goes for the last couple weeks where he was called upon to fill in for some regulars after hardly playing all season. I’ll definitely miss seeing him on the ice. Conor Sheary – Sheary was steady and reliable the entire season. With Gracel, UMass now has two skill puck movers to build with going into the future. Sheary also seems to have a lot of upside in terms of goal scoring going forward. His play was definitely one of the highlights this season. T.J. Syner – Syner provided a lot of leadership on the ice this year and has shown steady improvement every year in terms of points produced. He has become a player that opposing defenses focus in on and his speed is becoming legendary. Next year he has the potential to be one of the elite forwards in the league if he can finish his shots and not lose the puck along the boards as much. Conor Allen – Allen struggled a bit to start the season but progressed nicely, first securing his defensive game and then even contributing offensively. He’ll be looked upon to play a key role against some very good offensive players next year. Mike Donnellan – I honestly don’t know what’s going on with Donnellan who played only three games this year. I can’t say I’ve seen him played badly in the times I have seen him, but I don’t know what he looks like in practice. I liked the idea of playing him at forward to give UMass some muscle but that experiment didn’t seem to last long even though it seemed like a legitimate strategy. I’m not sure how he fits into future plans. Joel Hanley – Hanley had an awful beginning to his season with his brother passing away and an awful end when he came down with mono and missed the last few games. But in between he looked very good. He certainly can be considered one of the top freshmen defensemen in Hockey East in a year which had a lot of them. His two way game will play a huge role for UMass in the future. Doug Kublin – One of the most reliable defensemen in UMass history. I’m actually quite pissed that he wasn’t even runner-up for the Old Time Hockey Defensive Defenseman award given out today. It’s obvious it was just chosen by looking up +/- without actually considering the individual players’ performance. UMass will miss Kubby next year. Mike Marcou – Marcou had a very tough year. He had a disappointing year on the ice and even missed time with injury. Whether that was because he felt more pressure this year around with a letter on his chest or what, I’m not sure. I think for next year he has to get back to basics. Marcou is never going to be the most athletic person on the ice, but he has shown the ability to be a very smart defenseman who has good positioning. He’ll have to get back to this next year when UMass will really need his senior leadership on the blueline. Adam Phillips – Overall Phillips looked pretty good for someone still learning the defense position. His work on the blueline got better as the season went on and his slapshot became one of the team’s greatest weapons. Offensively and defensively Phillips will be an important piece of next year’s team. Anthony Raiola – Raiola only played in one game before January, a matchup against Minnesota before a hometown crowd where he scored a goal. But down the stretch he came in and played solid defense against tough teams. Without a doubt he’ll compete for an everyday spot on the blueline next year. Darren Rowe – To start the season it looked like Rowe would have a huge role to play on the team, scoring 5 goals in his first 5 games. But he played intermittently after that and went without a goal for the rest of the season. With the other freshmen playing better defense he seemed to be the odd man out. I still think his future on this team is at forward. Colin Shea – I saw Shea play multiple times in juniors and didn’t think he could be an everyday player as a freshman. I was wrong. He ended up playing 30 games, contributed 5 points, and was only a -3 on defense. Needless to say, he’ll likely be a mainstay on defense for the next three years. Paul Dainton – Captain, team MVP, and holder of multiple UMass records. His season got off to a rocky start thanks to an injury and his play coming back from it wasn’t up to his usual standards. But as the season went along he got better and better until he was playing some of the best hockey of his career by the end. It’s tough to see him go out with a losing record, because he really is a great hockey player and a great person. Kevin Moore – The small amount of fans in attendance were thrilled to see Moore see some time in net during the exhibition with Sweden. Little did they know that Moore would get to make his collegiate debut against Merrimack during the debacle in North Andover. 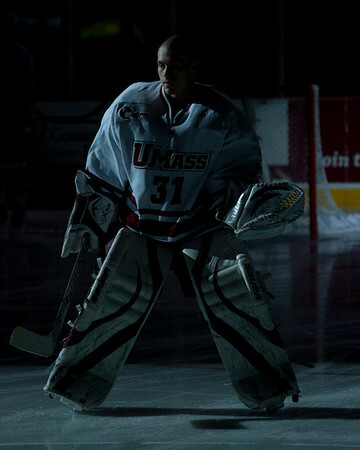 1.000 career save percentage and statistically the best goaltender in the history of UMass. Jeff Teglia – His stats don’t show it but Teglia did have a good year that he can build off. I’m sure going into the season Toot thought he would be able to put Tegs in for games against Lowell or Providence. Instead he’s starting against BU the second week of the season and basically playing both games out a Wisconsin. The experience he got is good and something that will prepare him for next season where he’ll likely go into the fall as the likely starting goaltender. I think there are two things that Toot and the coaching staff really did well this season. First was the selection of captains. He let the players have a bigger hand in the selection and more importantly he selected a good group of guys. Dainton isn’t the normal team captain since he’s a goaltender first of all and by all accounts not a big rah rah guy. He leads by example. But he set a great example for these young players and the poise he showed in net rubbed off on them and help them stay calm and focused throughout what was likely a frustrating season. By picking Syner, Marcou, and Hobbs as assistants, Toot already has his leadership in place for next season and hopefully make for a quicker transition to a more successful team. The second part of the coaching I liked from Toot this season was his recruiting. He directly addressed some of the major needs from the current team. Teglia played well but he did get injured and he’ll have to work on some aspects of his game in order to be successful going forward. So Toot went out and got another solid goaltending recruit to compete for the job next fall in Steve Mastalerz. At the same time this team was lacking size and bruising type players. He went out and got Steve Busillo from the AtlJHL and towering Oleg Yevenko who is 2nd in the USHL in penalty minutes. I don’t think teams will be taking as many liberties with guys like T.J. Syner or Kevin Czepiel next year with guys like that around. The only criticism I really had of Toot this year was his stubbornness to reengineer the power play when it was obviously broken. He did come around eventually and the extra man advantage saw some moderate success at the end of the season. But it was clear from the start that the young team couldn’t really grasp the power play strategy and there were times when it was absolutely killing their chances at success during points in the season. This was certainly a tough season to be a UMass fan with the team posting its lowest win total since 1997-98 (better known as my senior year). I guess the team kind of weeded out the true fans from the bandwagon fans of the last few years. But, I think the true fans understood the challenge this young team faced and appreciated the effort they showed during the year. They also know that this season realistically was not going to be anything more than a stepping stone to future years. On one hand the six wins was less than expected for this team. On the other hand the sheer number of close games could bode well for the future. Throughout it all we got to see some excellent performances from Paul Dainton and Doug Kublin who will go down as two of my favorite UMass hockey players and together with the other seniors provided some excellent leadership to this freshmen class. If these freshman do go on in future years and accomplish some great things for UMass it’ll be important to remember this year and this senior class. One only has to look at Lowell to see that a young team in this tough league could lead to disastrous results. But thanks to these seniors who kept the freshmen grounded and the team together the players never gave up and went into every game thinking they could win. In future years when that effort actually turns into wins hopefully this season will just be seen as the pain that everyone had to experience to achieve future success. The boys over at Fight Mass have their season recap up as well. UMass could use some more dedicated student fans like those guys. I’m not sure if I was just way ahead of the game or what but Chris Heisenberg is now officially listing Joseph Manno as a UMass recruit for next year. Here’s a post I wrote about him when I first learned UMass was interested in him. Make sure to sign up for this year’s Reverse Raffle. $115 gets you and a guest free food, beer, wine, and a chance at prizes and $4,999. Plus you get to hang out with the coaches, parents, and some of the loyalest of UMass fans. I look forward to it every year. With the recap done I’ll likely be toning down the posting from the near daily basis I’ve been doing since September. The recruit updates will keep coming as long as they’re still playing (unfortunately Kevin Boyle’s team was eliminated this week). And I’ll post other UMass or general college hockey news as I see fit. It’s nice not to have the Marcou’s leaving/Wellman’s leaving/Irwin’s leaving circus from this time last year going on. But if anything comes up that I think UMass hockey fans want to know, you can bet that I’ll do my best to get it on here. 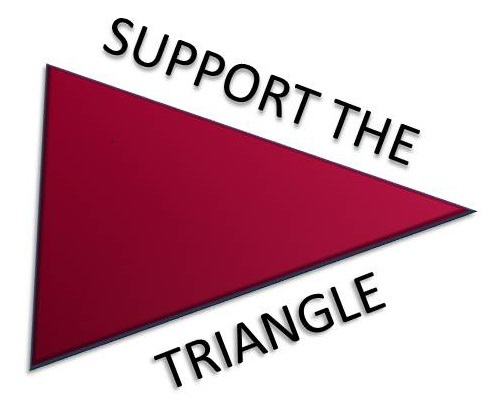 Even though it wasn’t an overwhelming successful season in terms of wins, I enjoyed following the team and helping others do the same through Fear The Triangle. I had a lot of good times and drank a lot of good beer. I got to see hockey arenas for the first time like the Kohl Center as well as favorite barns I haven’t been to in years like the Gutt. Along the way I’ve met and talked with some great people from hotel bars in Madison, Wisconsin to the concourse of the Mullins. I’ve met some really great people thanks to this site and I’ve enjoyed talking hockey, beer, or whatever else with everyone. I started FTT mostly as a hobby and a creative outlet but I am overwhelmed by how many hockey fans now visit here regularly. I’m glad I’ve been able to give Minutemen hockey fans one central place to gather on the interwebs. Thanks as always for reading.